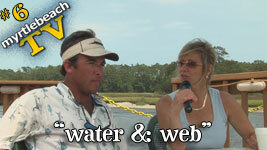 In our 6th episode, we spent all our time around the water and lots of our time talking about the web. We had the pleasure of interviewing EASON, one of the top local groups, and hearing them play for the first time (but definitely not the last). Eason performed at Dead Dog Saloon overlooking the marshwalk in Murrells Inlet, which alone would've made it a great week. We also met Brandon Sauls of iCoastalnet at Crab Catchers along the Little River waterfront and talked about his business, the web, and the directions his business and the web may be headed in the coming years. We rented a pontoon and spent a day on the waterway, snapping photos, shooting video, and stopping at Greg Norman's and Dynamite's at Dock Holidays for snacks and ice-cold drinks, and to talk more about the web. Later in the week we had the pleasure of meeting Angelo Antonucci, owner of Angelo's Steak and Pasta in Myrtle Beach.